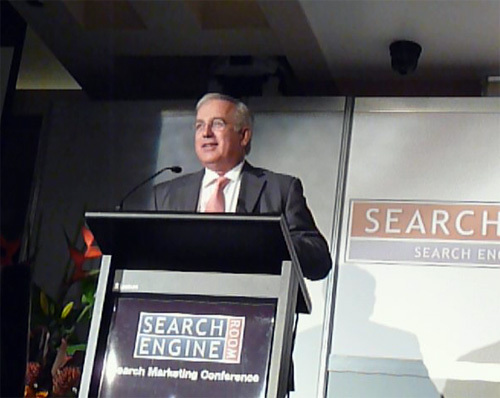 I attended the Search Engine Room 2009 conference and found the Keynote address by veteran journalist and entrepreneur Alan Kohler about The Click Economy full of useful insights about how the seismic changes in the media industry will play out and the impacts these changes will have on both advertising and publishing. Alan Kohler is one of Australia’s most well respected financial journalists. Previously a columnist at the Australian Financial Review (AFR), Alan has also served as Editor of The Age and AFR. For the past few years he’s been dividing his time between television on ABC TV’s Inside Business and Nightly News and his own websites Eureka Report and Business Spectator which aim to give ordinary people the business/market news, tools and knowledge to become independent and reclaim the control – and the money! – that is rightfully theirs. Alan’s keynote examined the latest trends of “The Click Economy” and how the dynamics of advertising have changed more in the past five years than the past 500. Search, now worth an estimated $800m a year, has been the catalyst. Suddenly it’s about performance, clicks and outcomes rather than advertisers renting space and hoping for the best. Alan Kohler – The Click Economy (20min) – 18Nov2009 – Search Engine Room conference Video Recorded by Neerav Bhatt on Vimeo.